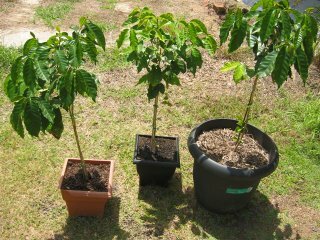 After we discussed growing your own coffee plants where many of you wrote in and gave some great tips I got inspired and are now growing my own coffee plants in pots in my Brisbane backyard. I know they don't like too much wind so they are being sheltered and they are also getting as much sun as I can find for them. I am hoping come July and September this year or next I might be able to make some "real coffee" from scratch. It was said you need 30 coffee plants to have 2 cups of ground coffee every day of the year. Just think how many coffee plants there must be in the world. If this all works out and these plants provide the Utopian cup of coffee then in the next picture there might be 10 times as many coffee plants to photograph. I am growing the Coffee K7 variety and because it is grown in a pot it will be naturally dwarfed however there is a new variety called Dwarf Coffee Plant - Catui. Well my coffee K7 has been in a sunny position for atleast one month and has nearly tripled in size, we have the espresso machine and coffee grinder but as yet can not find a benchtop roaster, for under $3000 that is. but hopefully aldi will bring one out soon. I need more coffee trees!!!!! Trippled in size that is fantastic. Where abouts do you live. I think that if you are serious about coffee you really do need to buy an industrial espresso machine. If you have made your own coffee from beans I would love if you could tell me all the little tricks you used to do do it. Wow, that is very interesting. I am in Canada, and I don't think I'd have too much luck with that! Let us know if you end up with that Utopian cup of coffee! Have a look at coffeesnobs.com.au for all the info you will need about roasting your own coffee. if you do dont put them in water after you roast them quickly shuffle them between two collanders as they will act as a heat sink and quickley bring them down to room temp.